A fun but frustrating physics-based puzzler. 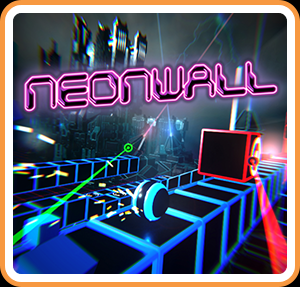 Neonwall is a game that’s full of deception, and I don’t necessarily mean this in a bad way. Upon first glance, you might think this little indie title embodies the epitome of gaming simplicity. It looks almost Tetris-esque, with its 80s retro vibe, and its basic gameplay consisting of little more than neon-colored blocks and balls. In a sense you’d be correct, at least when it comes to the game’s stripped-down nature. But looks can be deceiving, and you’ll quickly find just how difficult it can be to juggle the multiple tasks this physics-based puzzler requires. The game has the feel of a sort of brain-boosting endurance test that will push your gaming wits to the limit. Each stage more-or-less demands precision, fast reactions, anxiety-inducing coordination of multiple tasks, and the bombardment of dangerous obstacles throughout. All it takes is one run-in with an electric current, or a swift drop down a pitfall, and it’s back to the beginning of the level, or at least one of the few checkpoints. The actual premise and objective of the game is rather straightforward; guide a pinball from point A to point B by way of changing the color of the ball to match up with the colors of the blocks as it rolls. You achieve this by aiming near the vicinity of the ball and oscillating between R and L taps with two colored pinball paddles. A ball that matches the color of a block it comes into contact with will roll more quickly, which is vital for survival in a variety of situations. As you might imagine, this process of juggling tasks and shifting colors every few seconds to accommodate the assortment of the trio of block colors can be jarring and nerve wracking at first. Even in the easier and more straightforward stages, it’s no picnic cycling between blue, red, and green using only two paddles in real time as the ball inevitably rolls its way into trouble. Either paddle's corresponding color can be swapped to one of the other two colors at any time, though this is trickier to pull off with consistency than it seems with how fast things keep moving. You’ve got the aforementioned pitfalls and electric currents, along with treacherous slopes, obstructions that pop out of the ground, and blocks that must be shot and moved by using the corresponding color with your paddle. There are bridges that require you to match the color of your ball lest you plummet right through it. There are even blocks that propel your ball into the air; a satisfying feat, but one that can further coax swift and unexpected deaths amidst an already tough minefield of hazards. At various points throughout your 30 stage run, you’re thrown one of these curveballs for the first time just when you think you’ve gotten a decent grasp of the convoluted mechanics. Each introduction of one of these elements adds a new dynamic and just continually piles on to the gruelling challenge Neonwall pummels you with. The only real enemies you're fighting against are momentum, gravity, and, well, yourself. This may not sound like much, but it’s more than enough to keep you white-knuckled and slamming your controller in frustration throughout much of the experience. Stages come in a select few varieties: Time Trials, where you must reach a checkpoint before the timer runs out, obstacle-laden puzzle stages, and Runners, which force you to scramble towards the goal as the stage dissolves behind you. Whether emphasizing speed and reaction time, or survivalist cunning, each comes with its own type of difficulty. While 30 relatively short stages may sound like a pretty short run, there’s a good chance much of the game will require several maddening attempts before successful completion. Once I crossed the 10 level mark, trial and error pretty much became a prominent trend as I found myself biting the dust countless times on a majority of stages from then on. It doesn’t help that the controls don’t feel quite as tight as they could be, as they come across a bit floaty and imprecise; a surprise considering how basic the premise of the game is. They’re certainly workable and aren’t broken by any means, but it takes a bit of time to get used to the somewhat sluggish and disjointed dual-stick aiming of the paddles. One neat feature of the Switch iteration is the motion control functionality of the separate joycons controlling the two paddles. It was fun to play around with for a while, though it wasn’t long before I reverted back to the tried-and-true joysticks, as the gyroscope movement proved even more clunky and awkward than the traditional setup. Still, it’s a neat inclusion for those who fancy the nostalgic waggle days of the Wii era, and impressive for such a simple indie game. Outside of this functionality, there are very few bells and whistles to this puzzler, as its only real selling point lies in the somewhat innovative twist it brings to the puzzle genre. Even the aesthetics are quite bare, as you’d imagine, even if they do contain plenty of slick, illuminated graphics that are easy on the eyes and provide a nice 80s arcade charm to them. The soundtrack - consisting of some thumping techno beats and synthetic melodies - is appealing and fitting for Neonwall's style. Yet, like the game itself, both the visuals and audio are minimalistic to say the least. Some sort of co-op mode, unlockable content, or at least an online leaderboard would have been small but impactful additions to help flesh things out, but alas a single campaign mode is all we're given. Still, at as measly $10, Neonwall provides a fair amount of gameplay that is at least partially sufficient in both quality and quantity. Provided you have plenty of patience to wrap your brain around the odd mechanics, Neonwall offers an enjoyably fresh take on the physics-based puzzler. This review is based on a digital copy of Neonwall for the NS, provided by the publisher.